This is one of Kesha’s favorite spots in the house. Sitting on the foot rest of my Dad’s recliner. She isn’t thrilled with the recent blizzard. Can you tell? As we are closing in on the final few days before Christmas I thought I would share some more holiday inspiration. The gatherings are already in full swing, so I’ve also included some quick appetizer recipes. 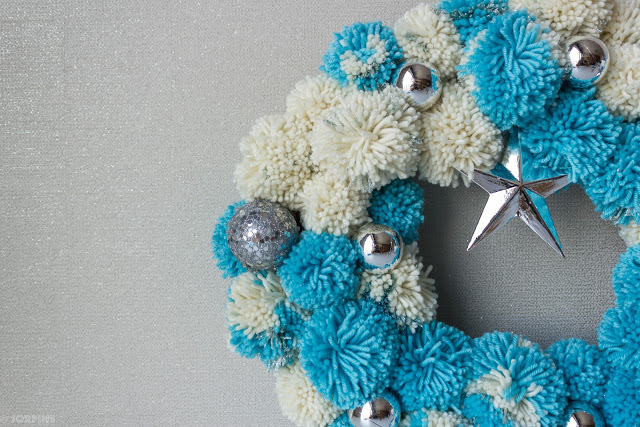 How CUTE is this pom pom wreath? My dear friend Emily created this for her home. Click here for the tutorial. I’m going to make one for myself next year. Are you familiar with Clover’s Tools? I spotted them at our local craft store last week (silent scream). Don’t have time to make a large wreath? Create a handful of pom poms for a smaller version to hang on the door knob. Accent your nicely wrapped holiday package with one. Adorable creation Emily! This is a great idea. So many unique uses for fabric. The buttons and yarn are perhaps my favorite here. Or maybe the hole punch ribbon. My nephews would love the race car wrapping paper. The concept can be utilized for any holiday or birthday. Yes, I will be doing this one for sure in 2013. Not sure what intrigues me so much with the alphabet, but I admire everything creative that can be done with a letter. Like this. Okay, now for some quick appetizer recipes. The list of ingredients is a bit long, but they are tossed together quickly. I’ve admired the photo of them in the checkout at the supermarket. Calzone pinwheels. Parmesan Cheese Straws, two ingredients. Can they be that simple? Shrimp meets bacon. Ten minute prep and twenty minutes to cook. Do you have any shot glasses tucked away in your cupboard or under the bar? These are adorable. Are you a fan of the traditional BLT sandwich? Turn that classic into an appetizer.